First Line: "You're absolutely certain this was the nurse you saw last night?" An old hospital is hit by a blackout. When the lights come back on, one nurse is dead and another has vanished. There's only one witness, and she claims that Nurse Tekla is responsible. The witness isn't being taken seriously because Nurse Tekla died in the hospital over sixty years ago. Enter Irene Huss, a former Ju-Jitsu champion, the mother of twin teenage girls, the wife of a successful chef, and a Detective Inspector in the Violent Crimes Unit of Goteborg, Sweden. It is her responsibility to make sense of doctors, nurses, patients, ghosts... and all the complex relationships involved. This is one series that's hurt by the way it's being published in the US. Undoubtedly due to legalities beyond my ken, the publishing order has been #1, #3, #5, and now with Night Rounds, #2. I read a lot of series, and I like to read them in order as much as possible, but in this case, I'd need to learn Swedish in order to do so. Irene Huss is a woman whose personal life is very much a part of the story and of the sort of character she is. Reading these books out of sequence is a bit like repeatedly stubbing your toe-- When did he? Why are they? She stopped? How did? Huh? If you like to read series (and read them in order), you might want to keep this in mind. If you're coming to Night Rounds with a clean slate, this won't make a bit of difference, so we'll move right along. Perhaps it's because she's in her forties, but Irene Huss seems to size up everyone she meets by how they look. It's a bit annoying, but I think it's meant to convey the fact that Irene feels time is marching on and she's ageing faster than she'd like. This habit has everything to do with her, and very little to do with the people with whom she's comparing herself. As I said earlier, Irene's personal life has a great deal to do with the type of inspector she is and with the action in the book. This adds a dimension to the book that I really enjoy. Police who are The Job and nothing but The Job tend to become boring. Irene's investigation is anything but boring. She and her team are stymied at every turn in that old, crumbling pile of a hospital with its one doctor and tales of the nurse who hung herself in the attic. The entire building seems filled with lurking shadows and breathy whispers. The case keeps returning to Nurse Tekla, Nurse Tekla, Nurse Tekla until Irene wants to scream. The only way she can get rid of Nurse Tekla is by doing the job painstakingly. By interviewing every person. By checking all the records. By knocking on every door. By double-checking. By triple-checking. It's long hard work, but Huss and her team are up to the task of taking the focus off the ghost stories and turning it on a very real killer. 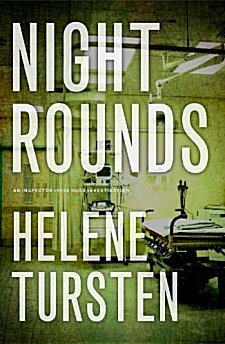 Helene Tursten's series is a fine blend of character study and police procedural, and regardless of their publishing order, I enjoy reading her books. Night Rounds at The Book Depository. Night Rounds at Your Favorite Indie Bookseller. Cathy - Thanks for the fine review. I couldn't possibly agree with you more about how annoying it is when a series is translated out of order. It's very hard to follow the characters as the author intended. I'm glad that you liked this one, though. I happen to like Tursten's work myself, and I am looking forward to reading this one (I just got my own copy). I think you're going to enjoy it, Margot! I always wonder why series are translated out of order. In the case of someone who's so popular in her own country that her books are being turned into movies, I wonder if it's got something to do with film production companies optioning rights to the books? I'll have to investigate this! Thank you for the review. I saw another review about this book and then forgot the title! That is so weird about the series being translated out of order. I really like this kind of book so it is a must read for me! Carol, I hate it when I don't make a note of a title and then can't remember it! This isn't the first time I've noticed a series being translated out of order, and I'm really in the mood to find out why. A future post may be in the works! This sounds like a book I might like to read, Cathy. How come I've never heard of it? Oh well, I'm adding the title to my TBR list and keeping in mind your comments on the series not being published in the order they've been written in this country. It normally doesn't bother me either unless the author weaves the character's life tightly into the narrative. A great review Cathy - I'm certainly tempted to read it!